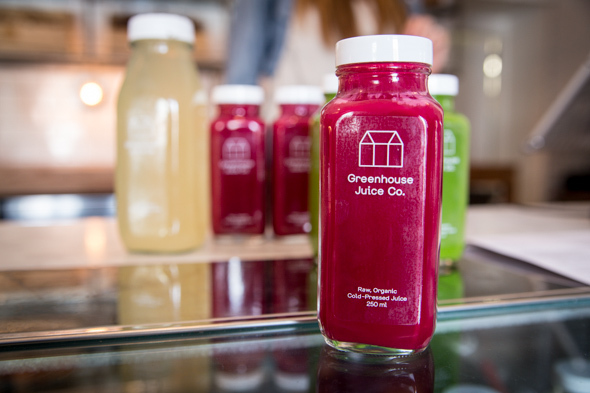 Greenhouse Juice Co. sits in a little white house tucked away off Yonge at Macpherson Ave. Decor is strips to basics - white walls, wide barn board, exposed beams; the morning light streams in the windows over wooden crates of vegetables waiting to be pressed. Succulents in terrariums dot the walls and wood countertops while the brightly hued bottles of juice sit waiting for consumers in the glowing fridge. 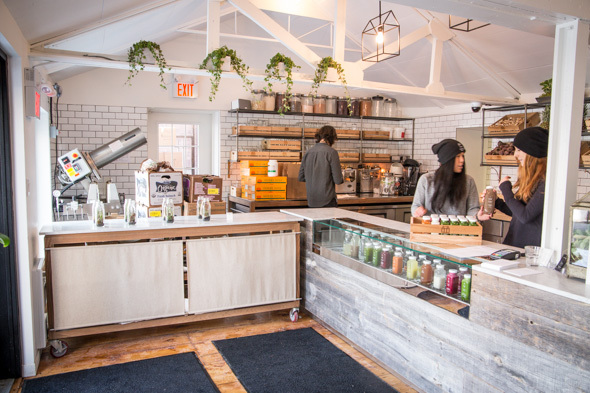 The brainchild of several Toronto friends relocated to New York and LA, who, seeing a lack of cold-pressed organic juice back home, began Greenhouse Juice Co to fill the void. 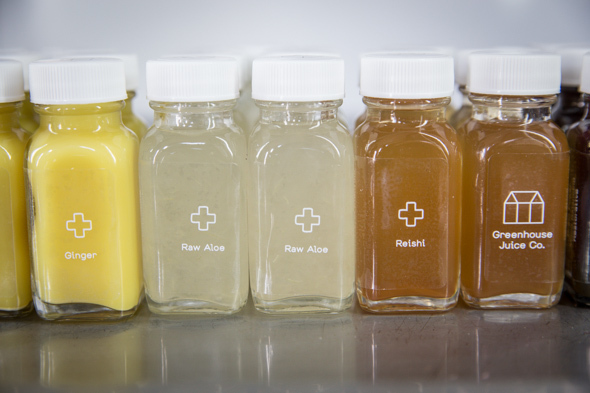 Cold-pressed juice differs from both grocer from concentrate varieties, home juicers and other juice bar methods in that they use hydraulic pressure to extract the live juice, added no heat or pasteurization. What results is a nutrient-dense, raw, and living elixir of the highest order. Anthony Green, one of the partners, is behind the bar with Hana James, and combined they are a wealth of knowledge. They are proud of the stringent control levels they employ in their juice making - if specific organic produce isn't available, they don't make that juice. The price point is high, but then so is the product. It's the Cristal of juice. James starts me on a juice flight , a sample profile of their various offerings. 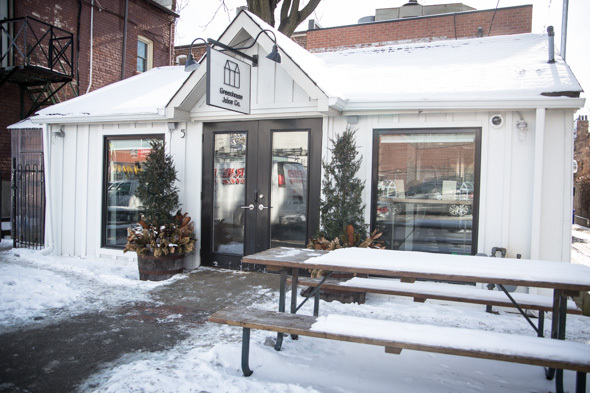 The menu includes the cold-pressed juices, handmade nut milks, smoothies, waters and boosters (tiny shots of nutrients more for health benefits than taste). We start with The Good , their most green juice, made with romaine, spinach cucumber, celery, lemon and Himalayan salt ($8.50 for 250ml, $11.50 for 500ml). It's earthy yet bright, like drinking liquid chlorophyll. 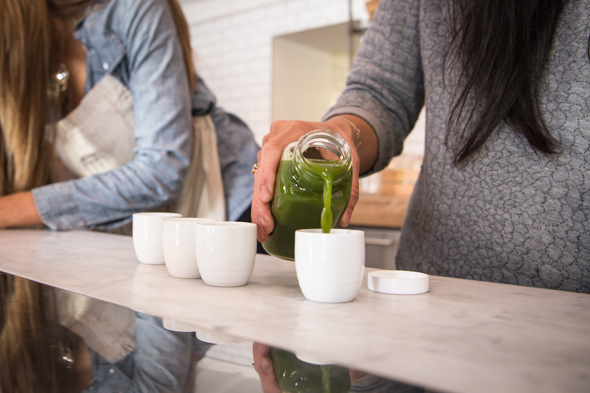 James suggests having a shot of their Chia Seed Hydrator ($5.00 for 250ml, $7.50 for 500ml) afterward, one of the waters they carry, as it helps absorb the nutrients of the green juice. The chia seeds are suspended in alkaline water with a dash of maple syrup and lemon, produce little in the way of flavour but texturally feel like tiny tapioca pearls or fish eggs. To your health, right? The Gold Rush ($8, $11), made with pineapple, cucumber, lemon and ginger, has a wonderful sweet heat and is a popular one. I like the water that follows, Clean-zing which contains alkaline water, lemon, maple syrup and liquid cayenne ($6, $8), a master cleanse-style jumpstart for your metabolism. The handmade nut milks are truly stellar. Their almond milk ($9, $12) is a blend of cold pressed almonds, alkaline water, vanilla bean, medjool dates and coconut oil, and blankets the mouth in a gently sweet and creamy way without being too rich. The almond milk provided the base for two other nut milks as well, the Green Milk, made with spinach and maple syrup, and the Pink Milk, made with beets and maple syrup ($10 for 250ml). Green Milk gives you the hint of being good for you, but the Pink Milk feels down-right sinful, the flavour so luxuriant it could pass as dessert. Cleansing programs are in development, as is an expanded food menu. As they experiment, new juices will be added to the already solid roster of flavours. Plus, they can keep tabs of your purchases too, and if you return your bottles for recycling your tenth purchase might just be free! 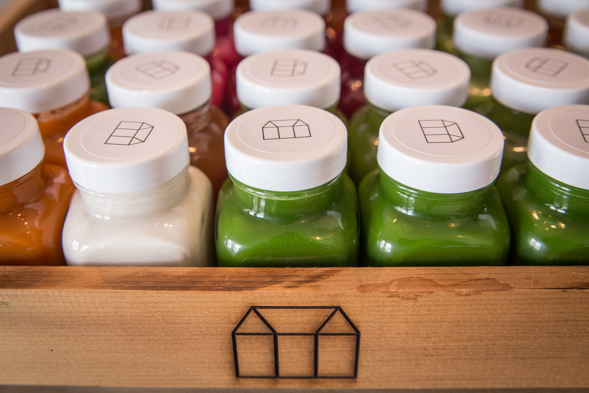 Greenhouse lets you Zen-out on getting juiced up.